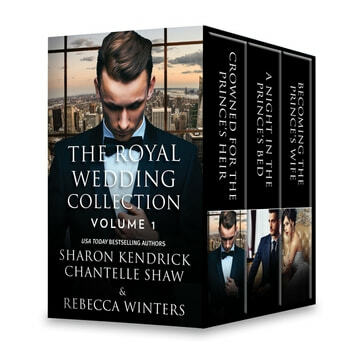 Say “I do” to three prince heroes in this collection of classic royal wedding romances. Dress designer Lisa Bailey reluctantly broke off her relationship with Luc, knowing an affair with the prince had no future. But one last stolen encounter left her quaking with passion, drenched in desire and unexpectedly pregnant! Months later, Prince Luciano Leonides of Mardovia is on the brink of the perfect political marriage when a news article shows Lisa with an obvious bump! Now he must claim his heir at any cost. She may be an unsuitable bride but she will become his queen! Beautiful Mina Hart has overcome her hearing challenge to become a leading theater actress. Then, one stolen night with a gorgeous stranger turns into headline news when it’s revealed he is the prince of Storvhal. Devastated when he accuses her of using him for publicity, Mina travels to his icy Scandinavian country to proclaim her innocence. A heavy snowfall traps them inside Prince Aksel’s private retreat, and now she must rely on her senses to read this haunted and intensely private prince! Attorney Carolena Baretti keeps her cards close to her chest. Except a chance encounter with the handsome prince ignites a fiery attraction, and Carolena finds that he may just be the one man she can trust…. Crown prince Valentino is increasingly distracted from his duty by commoner Carolena. But Valentino is playing with fire. To be with Carolena he would have to sacrifice everything—including his right to the throne….